This week’s BEACON Researchers at Work post is by MSU graduate student Kenna Lehmann. It never ceases to amaze me how returning to place after years away results in this dizzying contradiction: so much has changed, but everything feels the same. Four years ago, I was a Research Assistant for the MSU Hyena Project. I lived in a tent and collected behavioral and demographic data every morning and evening for ten months. The data I collected became a small piece of the dataset Professor Holekamp and her research assistants and graduate students have been gathering for 26 years. Four years later, I have returned to Kenya as one of those graduate students and so much has changed. I have been mentally preparing for my return to Kenya since I started graduate school in the fall of 2012. With all of that advance thinking, going back to Fisi Camp (fisi is Swahili for hyena) didn’t start feeling real until my supplies started arriving a couple of weeks ago. 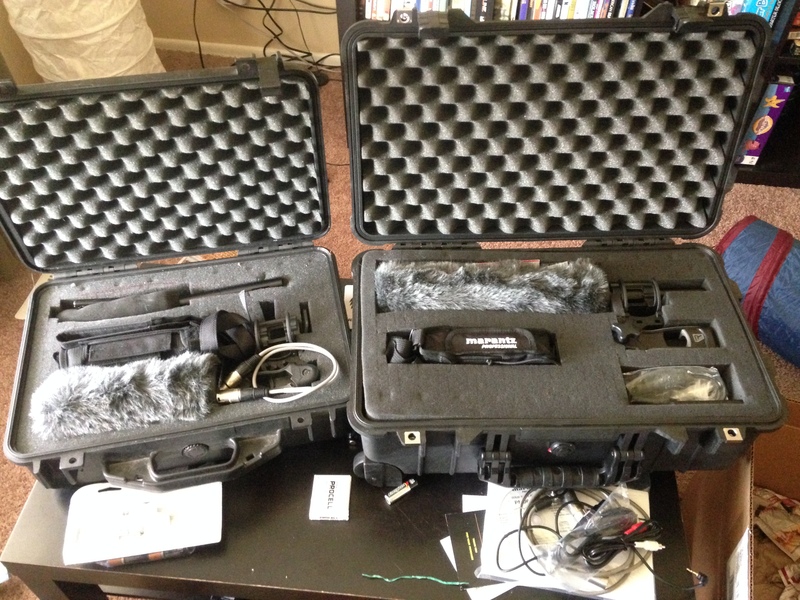 I will be studying hyena vocal communication and unfortunately, this means I need a LOT of equipment. I need recording equipment to record the hyena’s calls. I need speakers to play the recorded sounds back to the hyenas. 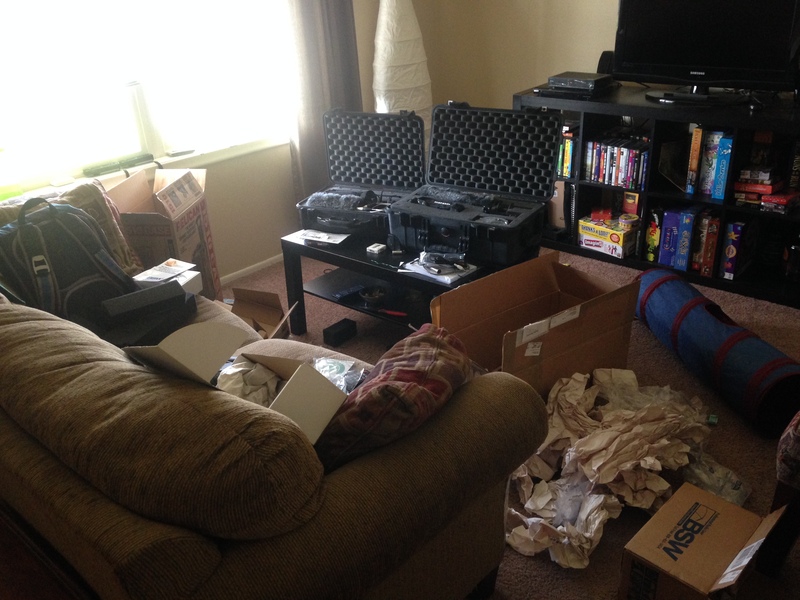 Plus, I need all the memory cards, hard drives, and batteries to keep all this equipment running (and I won’t bore you with all the underwear, personal field gear, and charging cords that are necessary for life in camp). 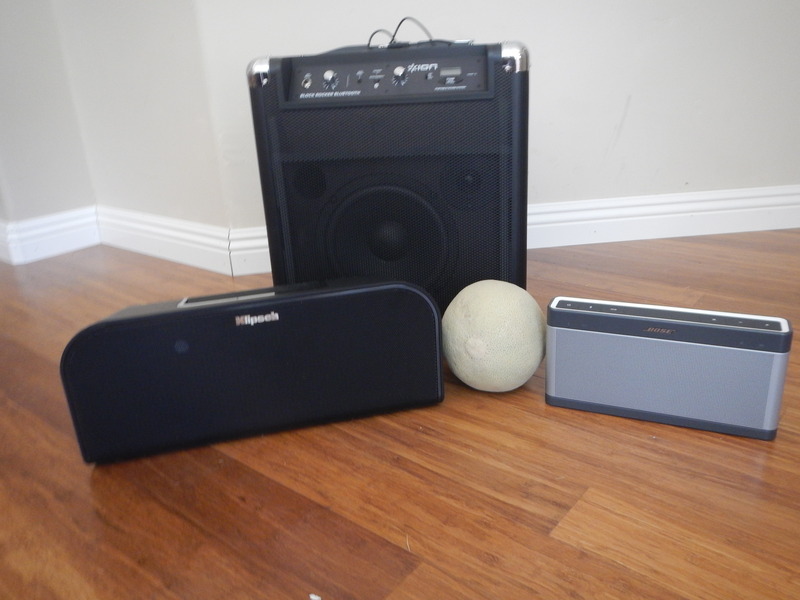 The three speakers I tested, with a cantelope for scale. The speakers were an adventure all by themselves. I have a lot of requirements and received advice ranging from “Anything will work” to “Nothing will work except custom speakers made by an expert” and “There is no way you will find speakers like that without having it plugged into external power.” I had a few brief panic attacks in the midst of this fiasco. In the end, I purchased three different portable, battery operated speakers and tested all of them out. The Klipsch speakers (the medium-sized ones in the picture above) ended up being the perfect combination of battery powered, amplitude, and sound clarity. With my back turned to them, it was easy to believe I had a hyena whooping behind me. If I can fool myself, then the hyenas should be fooled too (at least for a little while). Once you have devices that run on batteries, you need batteries to go with it. Suddenly, you feel as if you’ve given a mouse a cookie. Now that you have rechargeable batteries, you need a battery charger, and then you need to something to run those chargers. Our solar power in camp isn’t always reliable and we always have a ton of people using it. This made a solar set-up necessary. The last thing I want is to have good weather, no mud, great hyena cooperation, and no background noise, only to find that the recorder batteries have died. I ended up getting a lovely, compact set-up that includes a solar-powered battery and a rugged solar panel. 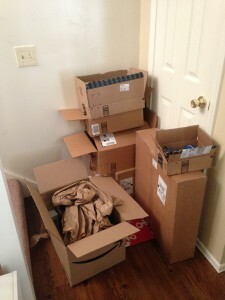 Just half of the boxes that arrived at my house. 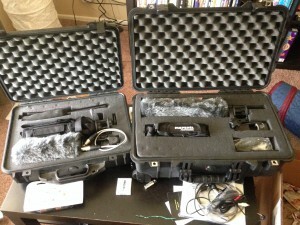 Two sets of recording equipment, plus their cases. This is only a portion of the mess. After this I got too embarrassed to take pictures. Luckily my roommates are also researchers so they tolerated the mess. Eventually, I packed everything into five very full, very heavy bags. And I was ready to fly out!! 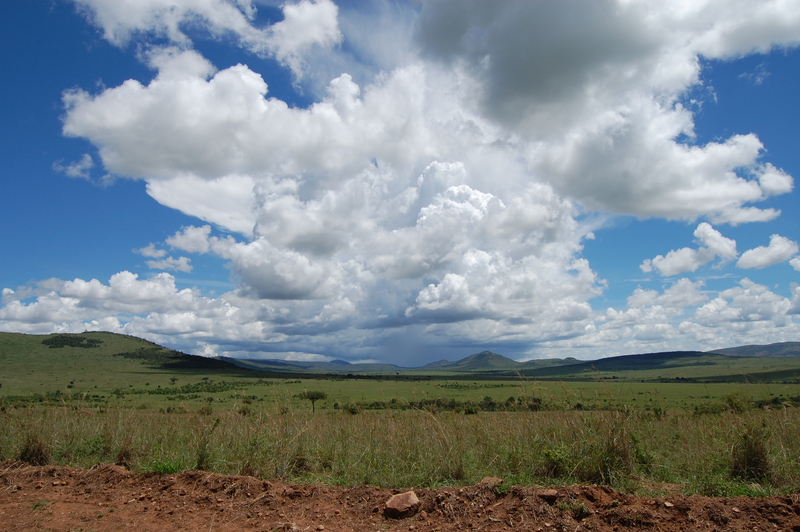 Now, I find myself in Kenya, this place I called home for ten months. It still feels like home, but so much has changed! The hyenas are different (although I was surprised to find there were a few I still recognize), the park itself has transformed, and camp and the nearby town have grown considerably. But, the most important difference is the data I am collecting will be critical for my dissertation. I will succeed or fail based on their quality and quantity. As I mentioned, my research here focuses on the vocal communication of the spotted hyena (Crocuta crocuta). I hope to help us begin to understand the evolution and the function of vocal communication in the complex social world that hyenas must navigate. No pressure, there. But, in the end, even if the stakes are higher and that crossing I used every day four years ago is now impassable, this tent I am typing from still feels like home. Not all that much has changed. If you’re interested in reading more blog posts from Kenna and the MSU Hyena Project, check out their blog at msuhyenas.blogspot.com! This entry was posted in BEACON Researchers at Work and tagged BEACON Researchers at Work, Field Biology, hyenas. Bookmark the permalink.